Non chill-filtered. Smoky. Sweet. Singularly rounded. The Ardbeg distillery lies on the most southerly part of Islay on the rugged shores of the Atlantic Ocean. Ardbeg Distillery is subject to fierce winds, driving rain and eerie coverings of mist. These weather conditions would be more extreme were it not for the shelter of the Mull of Oa. The Distillery is sheltered from the harsh excess of the mighty Atlantic by the rounded Oa, the inspiration for the outstanding Ardbeg An Oa. Like the peninsula that shares its name, Ardbeg An Oa is particularly rounded, due in no small part to time spent in the gathering vat. Here we marry together whisky from several different casks, including new charred oak, PX sherry and first fill bourbon. Here they become fully familiar with each other. The result is a dram with smoky power, mellowed by a delectable, smooth sweetness. Hallmark Ardbeg peat, dark chocolate and aniseed are wrapped in smooth, silky butterscotch, black pepper and clove, before rising to an intense crescendo of flavour. 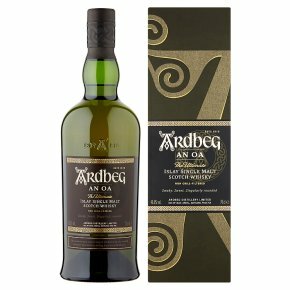 Ardbeg An Oa is non chill-filtered with a strength of 46.6% abv, to retain maximum flavour, more body and depth. With water a little cloudiness may occur, which is perfectly natural.